German Shepherd shedding. It’s just a fact of life that we’ve become accustomed to. BUT there is something you can do! Almost all dogs will on occasion shed their coat. 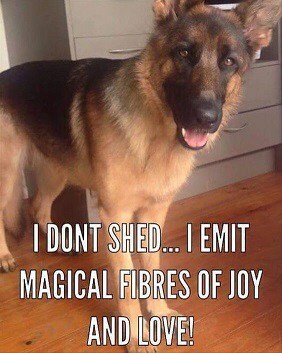 However, the German Shepherd is prolific shedder – which means they shed year-round. 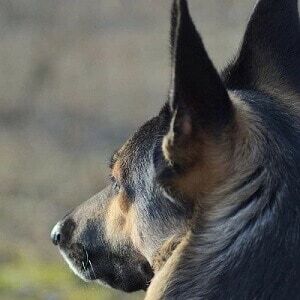 Weather and season does play a big role on how much the German Shepherd sheds, but the biggest factor is the overall health of the German Shepherd. If your German Shepherd sheds more than the norm, it might have undiagnosed health issues. When you decide to take a German Shepherd into your warm living room, he will immediately start to shed, since it doesn’t need all that fur. It’s impossible to stop a German Shepherd shedding altogether, but by keeping your German Shepherd healthy and well-groomed, you can reduce it. Sometimes German Shepherds are jokingly called “German Shedders”, the breed sheds year-round. Having a hair on your black pants and on your white couch is something every German Shepherd owner needs to accept. 1Feed your German Shepherd a high quality diet. One of the most effective ways of reducing shedding is to provide a healthy diet. Cheap dog food is largely made of ingredients that German Shepherds (and dogs in general) have a difficulty digesting, such as corn and grain. You should instead look for dog food that has meat as the main ingredient. Sure, it costs more, but it will help your German Shepherd in lots of different ways. Dog food with meat as its main ingredient are easier to digest and absorbed, which helps the overall health of your German Shepherd, and as a bonus it reduces shedding and helps with dry skin. You can also choose to make your own dog food. But you must keep in mind that German Shepherd shedding will never go away. 2Add olive oil or flaxseed oil to your German Shepherd’s food. Start out by giving 1 tsp. (5 mL) per 10 pounds (4.5 kg.) of body weight. The oils contain omega-3 fatty acids that helps calm inflamed skin, decrease dandruff, and improve overall coat texture. Lots of pet stores sell Omega-3 dietary supplements in either power form or capsules. You can ask your vet to figure out the best choice for your German Shepherd. You can also choose to increase your German Shepherd’s Omega-3 intake by feeding it tuna, salmon, or any other Omega-3 rich fish. 3“Treat” your dog with “human food” from time to time. Bananas, cucumbers, sliced apples (without seeds), and lean meats are all moisture-rich foods that helps your German Shepherd keep hydrated. If that wasn’t good enough, they also contain lots of healthy nutrients that helps your German Shepherds coat stay shiny and smooth and reduces shedding. However, only 5-10% of your German Shepherd’s daily food intake should be treats of any kind – the rest should be the before mentioned meat-rich dog food. Before giving any “human-food” to your German Shepherd you should always ensure that it isn’t harmful for dogs. You can check out a list at The American Society for the Prevention of Cruelty to Animals. 4Ensure your German Shepherd has access to clean, fresh drinking water at all times. Dehydration is really bad for dogs – no surprise there. But did you know that dehydration can lead to dry skin, which can cause shedding and (worse) illness. Make sure your German Shepherd ALWAYS have access to as much clean water as it wants. If you fear your German Shepherd is not drinking enough by itself, you can always choose to incorporate moist foods into its diet. Wet dog food contains up to 78% moisture – compared to 10% for dry food. 1Never skip “brush” day. Brush your German Shepherd’s coat regularly. Grooming your German Shepherd’s coat removes excess and loose fur and redistributes your German Shepherd’s skin oils into its fur (making it stay put). Always use a rake, since rakes are made for dog breeds with long hair and thick undercoats (German Shepherds are in this category, I hope you know that!). When you go buy a rake, make sure its pins are about as long as your German Shepherd’s fur. 2Use de-shedding tools just prior to spring. Don’t forget to de-shed your German Shepherd just before spring, before its winter coat falls off – and again in the fall when the winter coat starts growing. If you don’t, you will have to vacuum every hour. 3Give your German Shepherd regular baths. Loose hair will fall off in the tub – and trust me, it’s a lot better that they fall off in the tub (or driveway) instead of in your furniture. HOWEVER, you should never over-bathe, since that can cause dry skin, which causes shedding. The typical adult German Shepherd usually only needs a bath three or four times a year, provided you are brushing him on a regular basis. 4Kill the fleas! Fleas will cause your German Shepherd to scratch incessantly, which causes hair to fall off. Make sure your German Shepherd is free of fleas – which will prevent dandruff, irritated skin and lots of shedding. If you don’t know what to do about fleas, you can read about it on petmd.com. The German Shepherd fur can be divided into to three types. There’s the undercoat, which is a layer of soft thick hair that provides insulation. Next there’s the outer coat, which is thick and longer to protect the undercoat and the skin from temperature extremes and water. Finally, there are the whiskers, which are solid hairs that grow around a dog’s face and grant sensory stimulation. Unlike human hair follicles that can only contain one strand of hair, your German Shepherd’s hair follicles grow several hairs each. Your GSD’s hair follicles contain oil that helps keep its skin and fur in fine condition. When the hairs sprouting from hair follicles stop growing, they are shed to make room for new hair growth. How and when shedding takes place depends on your German Shepherd’s overall health, and genetics. It’s important to understand that shedding is a normal and necessary function designed to maintain your German Shepherd’s coat and skin in healthy condition. Use a dampened mop to sweep up loose dog hair from vinyl or hardwood floors. Consider adding wall-to-wall carpeting in your house. Carpeting “holds” down hair more than hard-wood floor – which ensures the hair not Wall-to-wall carpeting holds down the hair more than hard-wood or vinyl floors, thus adding a carpet to a room might help keep dog hair from wafting through your house. Use a dampened rubber glove or damp sponge to pick up loose dog hair that is attached to upholstered furniture. Get a sticky roller, and use it to remove dog hair from fabrics and upholstery. Use a window squeegee to pick up hair from your carpet. Opt for furniture made from smooth fabrics such as leather, faux leather, or other fabric to which hair won’t stick as easily. Draperies made of smooth fabrics won’t attract as much hair as heavy textured ones, so if you’re in the market for some new window furnishings, purchase ones that are less likely to become filled with your dog’s hair. Use a feather duster to clean between slats of mini-blinds to remove hair. I have a 2 year old German shepherd and he does shed a lot …thanks for ur tips.I missed on training him so finding it difficult to handle him sometimes. Thanks for the kind words 🙂 It is NEVER to late to train your German Shepherd, it’s just easier as a puppy. So I’d suggest you get to it 🙂 Good luck! I add some olive oil to my Burts Bee Oatmeal shampoo. It seems to be quite soothing to my pretty girl. Her coat looks absolutely beautiful after her bath. Fluffy and silky. Hello I live in country with a hot climate. It summer pretty much all year round, when should I de she, if I don’t really a spring or winter season here. I put my GSD down at almost 12 years old, he was my love. I rescued another German Shepherd who was in pretty bad shape, 58 lbs. little hair. A year later, I’m totally in love, he is 105 pounds and has more hair shedding than I’ve ever experienced. I’m hoping it’s because it’s his first real coat. He’s on a great diet, I added a bit of olive oil in the morning. He doesn’t like baths so that’s not an option other than torment with the hose during the summer months. I just had an aneurysm reading that and woke up with my arm inside my washing machine while it was running and I’m not talking like my fingertips were in there I’m talking shoulder-deep in that washing machine with it churning back and forth like a circular wave pool with all my clothes in there! What an exhilarating experience I must tell you.